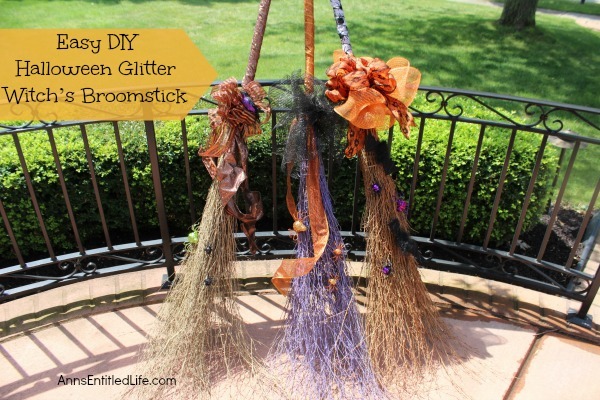 Simple and fun to make Halloween Witch’s Glitter Broomstick Tutorial DIY project. 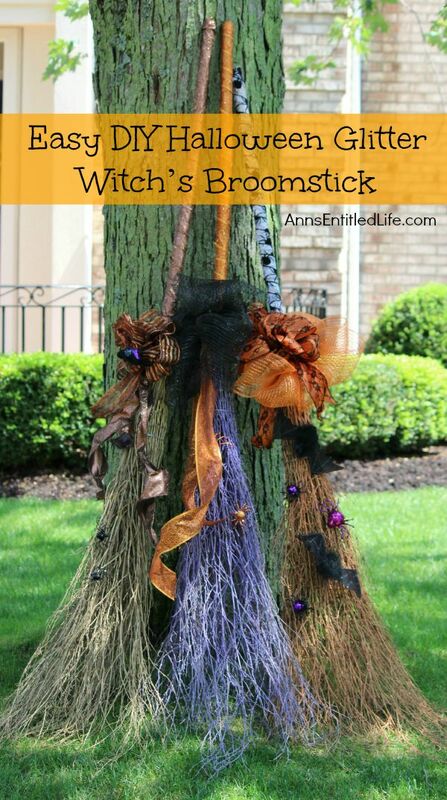 With just an hour of your time, and you have a wonderful 6 foot tall witch’s broomstick to make your Halloween decor, or costume, complete! As we approach Halloween, it has become time for me to think of the decor I’d like this year. While I do decorate for fall, I switch it up in October for Halloween. This year, my foyer is going to be spooktacular! 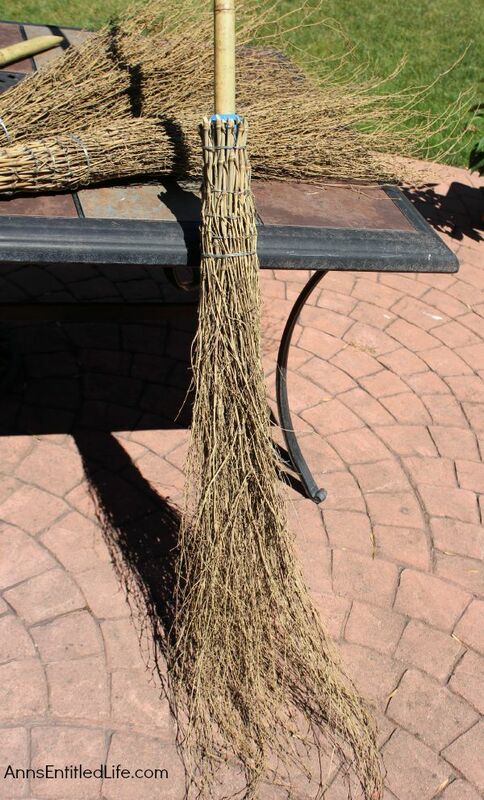 I saw a photograph some time back from someone who made a glitter witches broom with a regular corn broom. The photo was just that: a photograph. It did not lead to anything with directions. 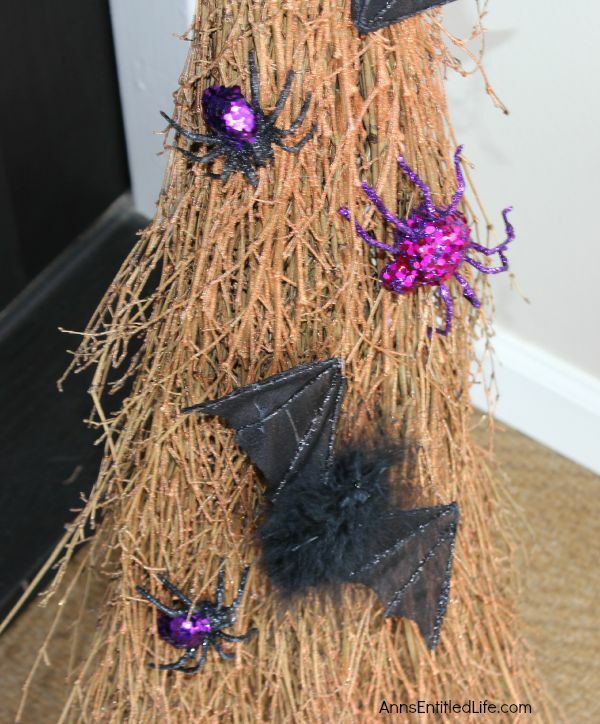 And while the corn broom was super cute, it wasn’t quite what I wanted for my foyer Halloween decor. 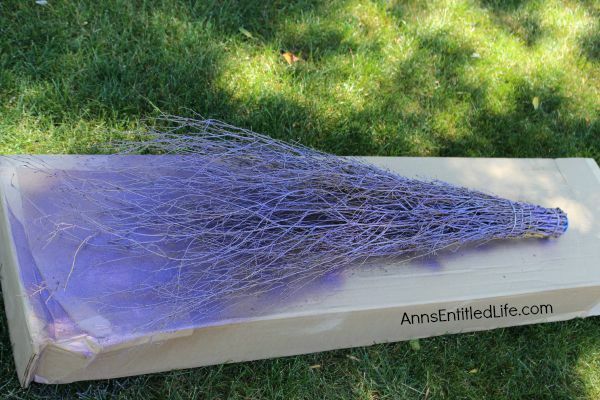 I wanted an “authentic” witch’s broom! Of course I looked through all the costume shops, places that sold holiday decor, and other usual suspects for a witch broomstick, but they were none to be found at a reasonable price that were over 3 feet tall. All I could think of is what kind of witch only uses a 36 inch broomstick? One that can shrink herself with magic? I wanted a 5 foot or 6 foot tall broomstick, so I googled and googled and found a few handmade creations on etsy – for $50. That was too rich for my blood considering my plans for said broomstick. I then asked Hubby to help, and he went on a mission too. Eventually, I found these awesome cobweb brooms at Smith Brothers for $14.99 each! Sold! • The Broom Brothers – OMG these are fabulous! 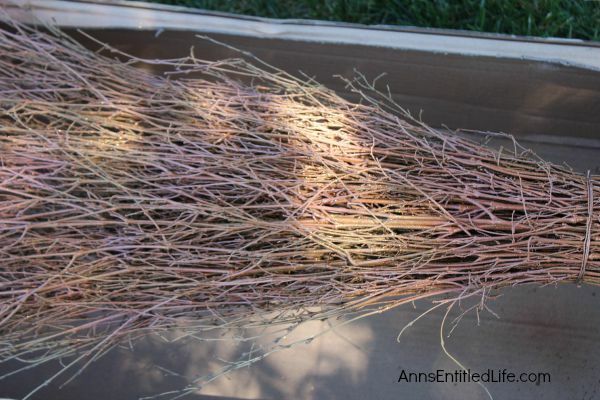 • Check Alibaba – they had a few that “could” work, along with the newer-type cobweb brooms that definitely will not work. 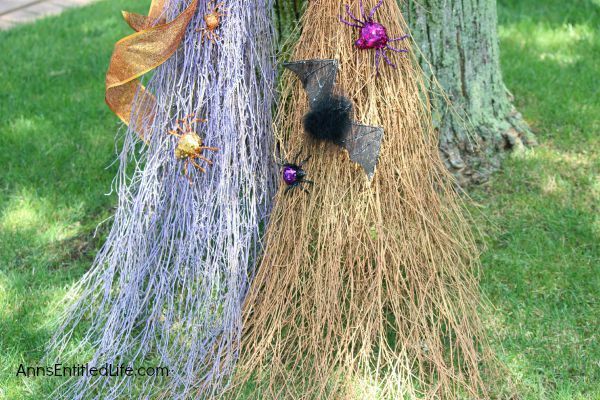 • If all else fails, you can make your own cobweb broom! So now how to color the bamboo in the broomstick? Well with glitter spray paint of course! I had to decide between Rust-Oleum Glitter Spray and Krylon Glitter Blast. The reviews for both were underwhelming, the Krylon having some spectacularly bad stories. In the end, I did go with the Krylon Glitter Blast because I could get orange. 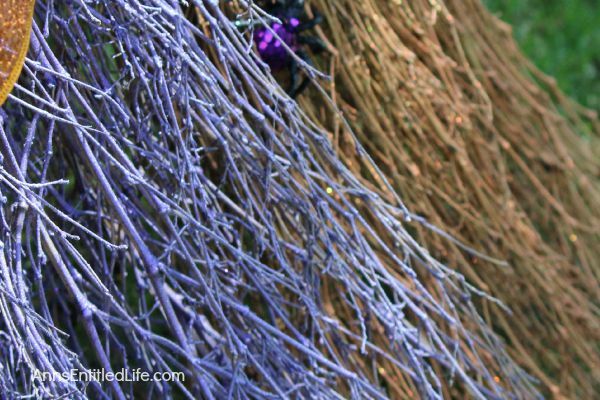 I also used the Grape Glitz for my purple broom, and the glitter sealing spray. 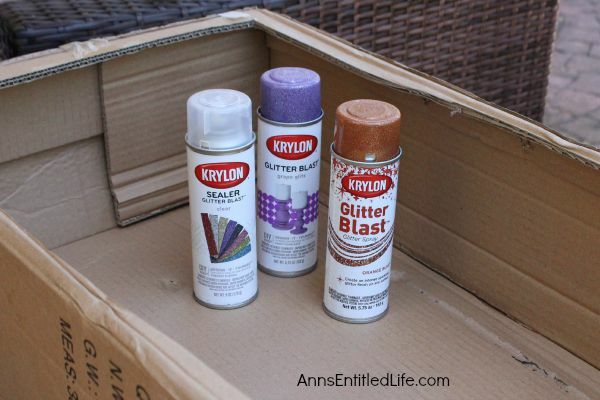 • 2 cans Krylon Glitter Blast – I used Krylon Orange Burst that I picked up at a local hardware store, and Krylon Grape Glitz that I purchased at Amazon (where it was cheaper). • “Creepy” Decor. 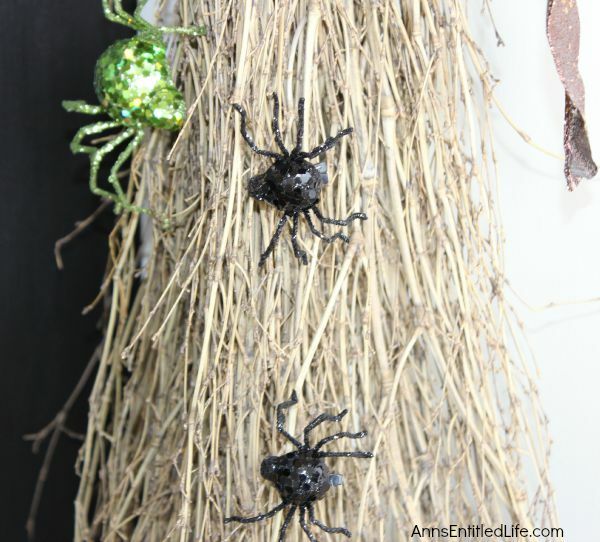 I bought the bats, spiders and bird used to decorate by broomsticks at Michaels. The clips on the spiders made it super easy to reposition them until I found the placement I liked best! After opening up the box of cobweb brooms, I assembled one by inserting the handle, turning it upside down and pressing. That was it. I heard a “click” and knew it was attached. I did not assemble the other two brooms. 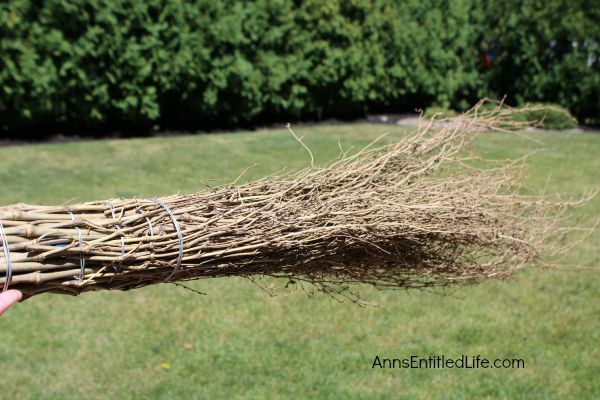 I planned on keeping one natural just in case I decided to use it… as a broom! The two I did not immediately assemble due to plans for painting the bamboo bristles – I did not want to get paint on the pole. I painted these over the grass – I was concerned about overspray and ventilation, so the painting was done outside. I chose to work on the grass because any overspray would be gone with the next grass cutting! I placed down two cardboard boxes… one for each broom base. I shook the Krylon Glitter Blast for 2 minutes, then, with long even strokes, sprayed. 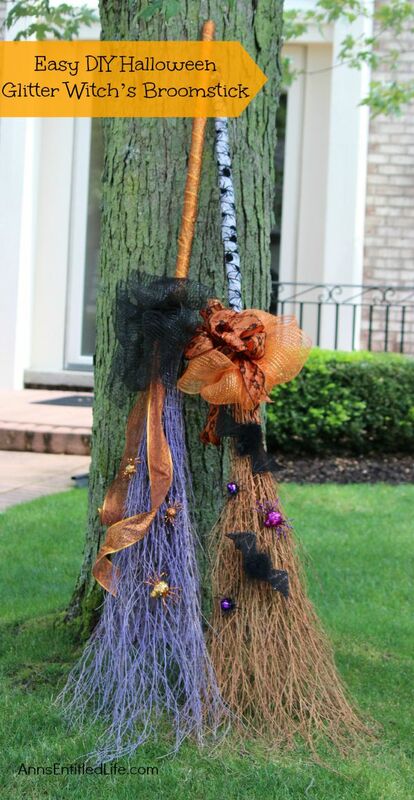 I used Krylon Orange Burst on one broom and Krylon Grape Glitz on a second broom. I then waited the 20 minutes the can suggested for dry time. I turned the broom over, and sprayed the other side. I also sprayed the sides. I used two cans of Krylon Glitter Blast for each broom. There were a lot of bamboo bristles in these! If I had left the glitter paint it as is without the sealer these would have been the glitteriest, shiniest, most sparkliest brooms you had ever seen! 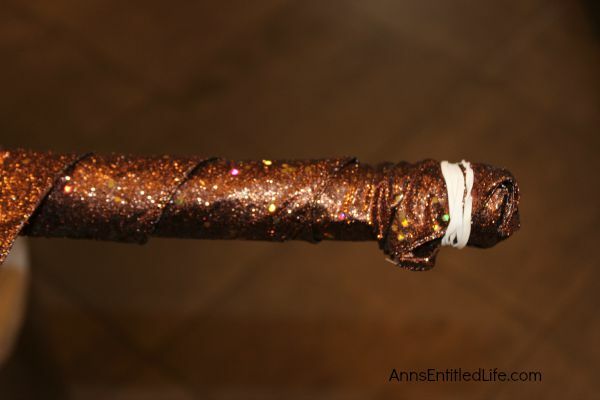 But, I was worried about the glitter dropping off at some point, so I sealed the broom bristles. It is still glittery, but not as glittery. Note: after finishing these broomsticks other colors I think would look great are black or green. BUT, I have not used either so can’t be 100% certain. I like the purple one I did best because it is so vibrant (and why I have a feeling green would look fantastic). However, the orange shows better in the sunlight. I waited a full day for the paint to dry before attaching and decorating the handles. You can see some sparks in that photo. This is where my photography skills failed me. These sparkle and snap in the sunlight, even after the sealer has been applied! This was my collection of “creepy” decorations and ribbons that I had available to choose from. I used 15 feet of 2 1/2″ ribbon to cover the stick and allow a drape. I paid special attention to covering the blue where the handle attached to the bristles wrapping that several times to conceal it. I also used ribbon and paddle wire to make a bow (and bought one). The bats were hanging bats that I cut the hangers off of and attached to the bristles with hot glue. The spiders had clips on the back. Highly recommend the clips! I did attach each handle before decorating it. (I was afraid of knocking off the ribbon when I inserted the handle into the base after decorating it, so attached before decorating.) Once I attached the handle, I wrapped my chosen ribbon around the shaft. I started at the top by using a rubber band to hold the ribbon in place. I hot glued it last. Every 4-5 turns I put a dab of hot glue on the ribbon and shaft to hold it in place. I did not do this on the broom I “might” use, and there is a real difference in ribbon-gap and stability. Still, if I ever plan on using that non-glittered broom as a functioning broomstick, I had to be able to get the ribbon off the handle! Once the ribbon was attached, I added a bow (with wire), and clipped on some creepy crawlers. I hot glued a few bats to one broom, and wired a dark bird to a different broom. 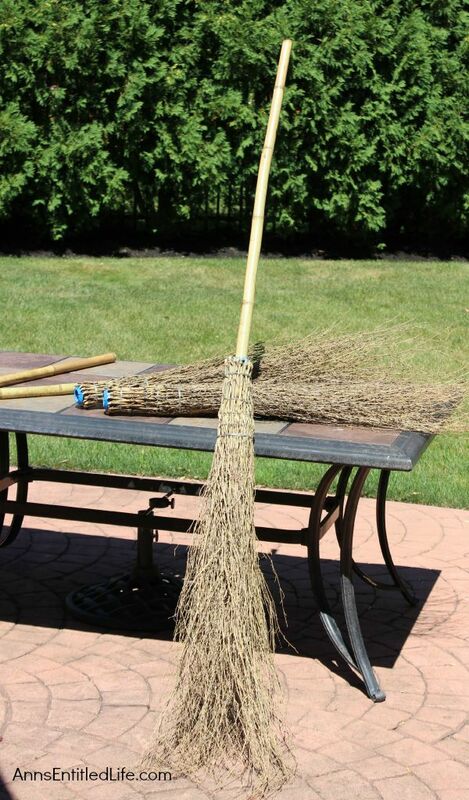 The work time on all three brooms was approximately two hours. This was a fast and easy work project, although it DID take some time to allow the paint to dry. If you wanted to do this yourself, figure 20 minutes in between paint coats and sealer coat, and then an hour after you can work on it to be sure it is completely dry (I still recommend waiting overnight). Decorating took about 20-30 minutes per broom. Turning the ribbon around the handle without getting it stuck was the most time consuming, and that took under 10 minutes. 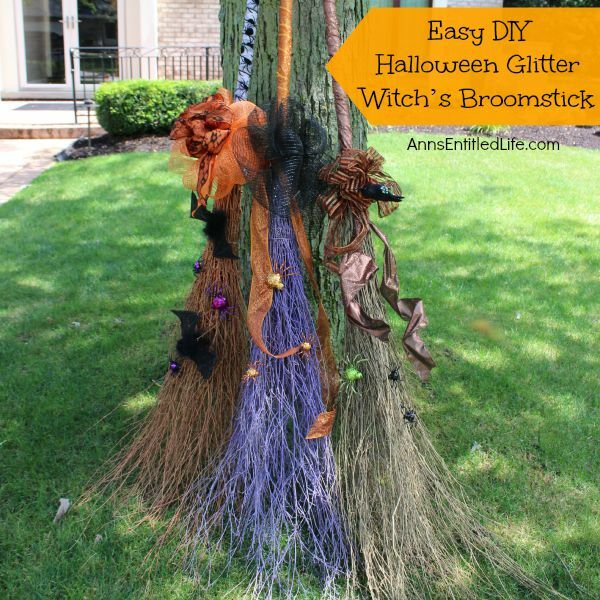 If you are looking for a simple project to dress up your Halloween decor or Witch Costume, give these Glitter Brooms a go! They are so easy, unique, and pretty! OMG!!! So freaking CUTE! You are awesome. I want one (or three). I can’t even believe how adorable these turned out. Thanks, Stephanie! I was SO pleased! Do one. Super duper easy!! Me and my daughter ordered 2 of these brooms. They are exactly as you described, but I was confused about the shipping charge. I understood by looking at their shipping chart that shipping on 3 brooms would be $8.00. 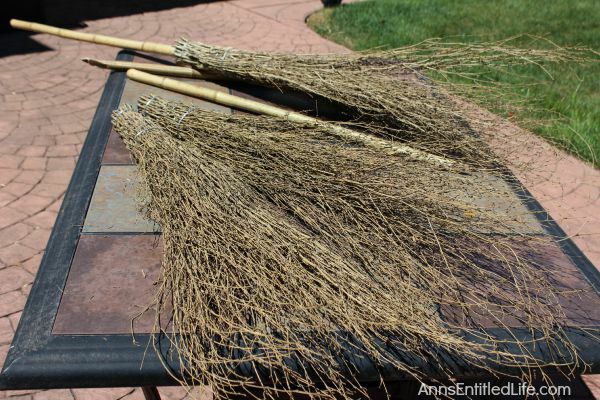 Was that $8 on each broom, or $8 for all three? Anita, the website says $8 additional shipping (for the large box size) for 1, 2 or 3. If they charged you an extra $8 each, I would definitely contact them. Thank you so much! My daughter said that it was $8 each, but it didn’t look like that was the case to me. I will call them, and thank you again. Thanks Didi! They really are easy to make. Try it, you’ll like it! That’s such a great transformation of a twig broom. 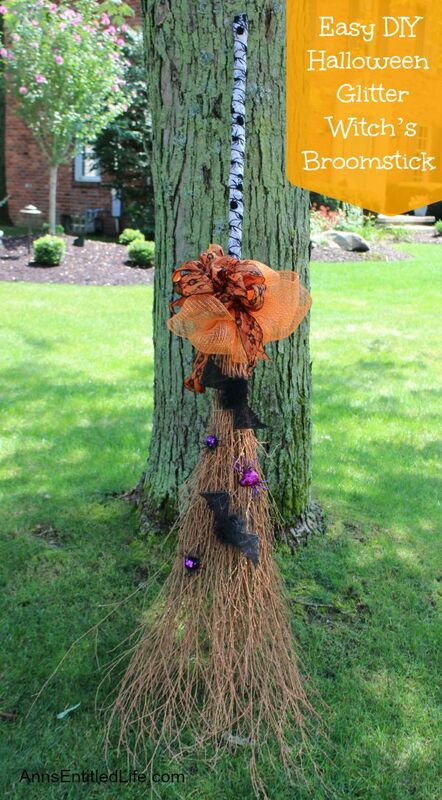 The addition of the Halloween ribbon and decorations really make the broom special. 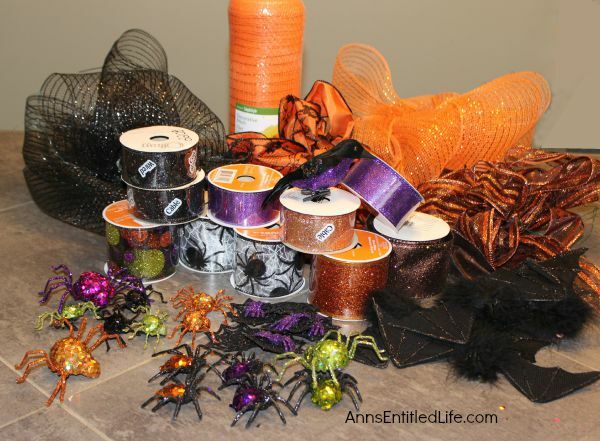 I hope you can come and share this on the Halloween Spooktacular Link Party. Thank you! Thank you! Thank you! I’ve been trying to put together a “Broom Shoppe” for Trunk or Treat this year, but, like you, I could on;y find tiny, cheap brooms or really expensive ones. I’ve been getting really discouraged. And now, BAM! I found a link to you on Pinterest. What a relief! As a bonus, you explain your instructions really well. I appreciate that, too. Am ordering from Smith Brothers as soon as I finish here. So cute! Wow! I am so glad you liked it, Mary! I love your brooms. They turned out so adorable.